It’s no secret that we love to get our craft on here at LaurenConrad.com so you can imagine our excitement when Scotch Duct Tape sent us a lovely box of goodies including their latest line of heavy-duty, colored tapes. Being the crafty crew that we are, we couldn’t resist doing a little DIY using the pretty stickies. 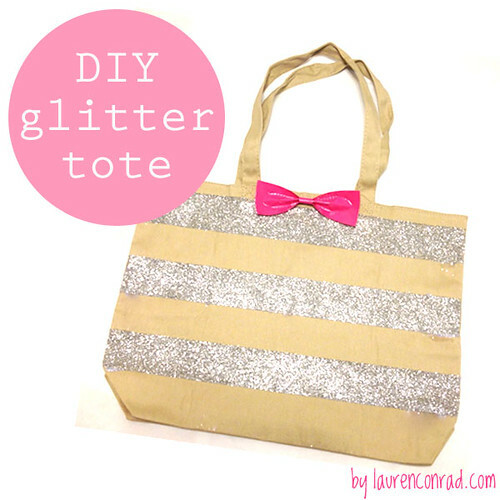 After brainstorming nearly a dozen different craft ideas we settled on two of our favorites: a striped glitter tote and a pretty tape bow. So today we are going to show you guys how to make your very own glittery striped tote bag just in time for back to school (or work!) season. 1 1/2 inch wide Scotch Duct Tape (in Hot Pink shown here, or the color or pattern of your choice) *We just couldn’t say no to this hot pink tape, but know that this is a non-traditional way to get straight lines. You should opt for Scotch Blue tape for straight lines. Tape off the top of the tote starting from the top stitched line of the bag. This will ensure that all of your stripes are straight. Continue to tape the entire front side of the tote, aligning each piece of tape with the next. Remove every other strip of tape. These spaces will be your glittery stripes! Be sure to save the strips of spare tape because you will need them later for the bow detail. Apply pea-sized dots of fabric glitter glue along each stripe of exposed fabric. Using your sponge, spread out the glue until it is evenly covering the exposed stripe of fabric. Sprinkle glitter over the glue. For best results, give it between 1-2 hours to dry before removing the tape strips. Repeat steps 4 through 6 until each exposed fabric strip is glittered! Cut two strips of Scotch Duct Tape in the color or pattern of your choice. The first strip should be 5 inches and the second should be 4 1/2 inches. Place the smaller piece of tape on to the larger piece. Be sure to center the smaller piece. Sticky sides should be facing. Fold over each end sealing off the end of the tape. Using your thumb and index finger, pinch the tape together at the center. Fold the tape back on each side (like an accordion) and continue to hold firmly with your thumb and index finger. Snip off a small strip of tape and wrap it around the center of the bow where you have been holding with your thumb and index finger. Now you have yourself a pretty little bow! Once your glitter strips have dried completely, remove the tape and affix the tape bow using fabric glue or a pin. And voila–you have yourself a fabulous, sparkly new tote bag! If you’re headed back to school or need a new notebook for the office, why not make a pretty matching notepad too? We used our glitter skills to apply a thin strip of sparkle and then paired it with our favorite colored Scotch Duct Tape (we used Hot Pink so it would match the bow on the bag but there are lots of other colors and prints, we also love the lace print tape too). It’s simple and oh-so-chic. Are you going to give this DIY a try? Let us know in the comments below! 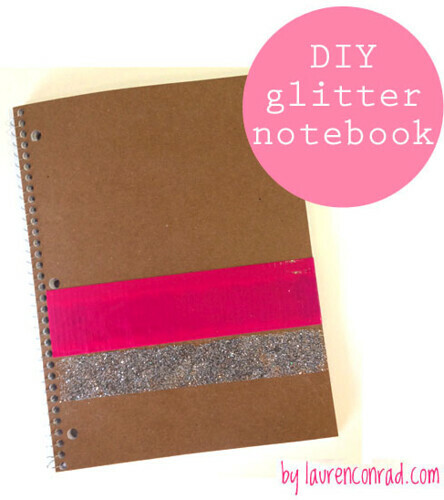 And be sure to upload a photo of your glitter tote and/or notebook too. We’ll feature our favorite photo submissions in a Member Spotlight!